Chamber donates $1,000 from recent Taste of Malden event to YMCA of Malden’s Summer Youth Food Programs. “Summer isn’t fun when you’re hungry” is the tag line the YMCA in Malden uses when promoting their Summer Food Service Program to potential sponsors and the Malden Chamber agrees. Last year the Y provided over 60,000 healthy meals and 35,000 nutritious snacks to youth and teens in Malden, Medford and Everett. 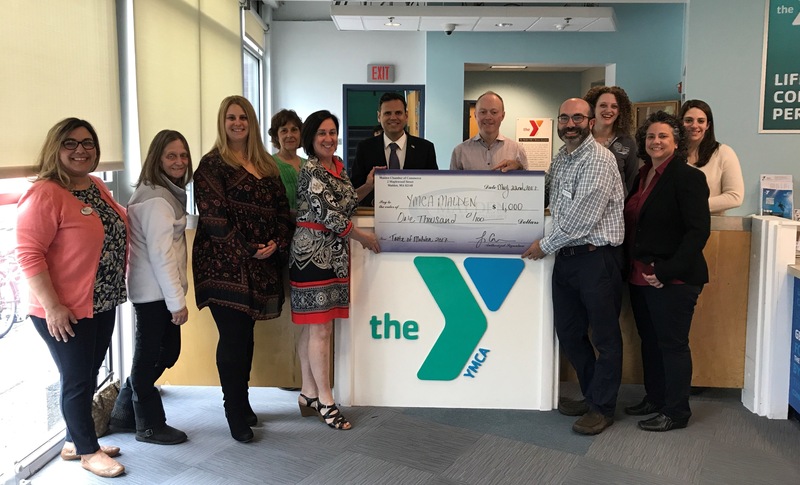 The Chamber invited restaurants that participated in their recent Taste of Malden to join them as they presented YMCA CEO, Debbie Amaral and YMCA Director of Community Development, Gregg Ellenberg with a check for $1,000. The Y also raised an additional $750 at the event through a variety of raffles. To learn more about the Chamber’s upcoming MCC SuperBowl II, which helps support Triangle, Inc. visit http://www.maldenchamber.org.